The cabal of sorcerers has dwelled with their baleful tower for hundreds of years. Now something evil stirs in the town of Bal-Curz — strange happenings of malefic magics and persons disappearing in the night. The fearful townsfolk whisper that its source stems from the Black Tower. Possibly a few bold heroes could investigate the tower to uncover its secrets and put an end to this unseen terror? 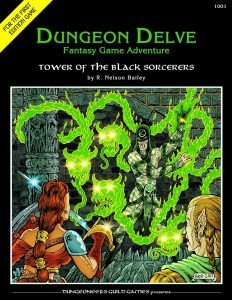 This 27 page adventure describes a 27 room tower of evil wizards and its single dungeon underneath. The usual wizard stuff, like libraries and summoning rooms. It’s quite verbose, at about two rooms per page. It’s not worth it to dig through it all, even if it does contain some depth and freaky monsters. This is offered as plotless, meaning it is offered as location rather than tying it to the end destination of a kidnapping plot, for example. Why the party is going in is up to the DM. There are a few ideas mentioned, most of which are the usual throwaways. A foot-race to win the hand of the lord mayors daughter, and the last temple in town are both more interesting options for getting the party involved, if the DM needs help. The few extra details present in each help elevate them above the usual “help us!” throwaways. The original monsters, and their art, are good. A human torso with the arms and legs replaced by spider legs, but ending in uman hands … freaky deaky! And with art to match! Likewise the adventure presents a bit of an order of battle, noting responses to incursions in the tower. Other than this you’ll find the usual stuff. Cells with prisoners, summoning circles, libraries, etc. The major, major detractor though is the length of the actual locations. These things are taking up about over half a page each, and of a smaller font at that. It has to have a seperate section, for each room, noting illumination. Then it goes in to detail about what the kitchen looks like. Then it may have a section on tactics. And then maybe there’s some backstory embedded in the location, telling us WHY. All with a penchant for overly flowery text in a conversational writing style. This doesn’t work. I’m not going to suggest “adventure to be read not played” but it is leaning in that direction. You can’t run an adventure, at the table, trying to dig through all that text. What do the players see? Who knows … you have to dig through a half page of text to find out. “Oh, uh, wait, it turns out that there’s a guy in here and he’s attacking you.” Indeed. We know what a kitchen looks like. A kitchen location in an adventure needs to only describe what is relevant to the adventure. If the chimney is a way in, or has a treasure hidden in it, for example. Telling us their is a carving block is worthless, unless it’s got the head wizards noggiin on it. All this extra text does is pad the word count and clog us the bowels of the text. Likewise tactics. Long tactics sections are boring and useless and generally a sign that the designer is overly invested in their creation. And as for backstory, here’s what makes up?’s of the entry for a cell with a bodak in it:” The bodak is the former master of the tower before Basharn rose to power. It seems that Basharn inadvertently gave the wizard the wrong information concerning a specific layer of the Abyss he intended to travel to. There the pure evil of the Abyss transformed him into a dreaded bo- dak. Basharn then summoned his former master back from the Abyss to employ him as a servant. However, the bodak remains rebellious, not yet submitting to the magic-user’s will.” What then, does this add to the adventurer that just death saved? That most certainly DOES smack of novel writing! The tactics section for a wizards starts with “In the event of intruders in the complex …” This is a classic IF/THEN writing style. IF the party opens the door to the room THEN they see … Padding. That’s all it is. A conversational style of writing. The room IS, just say so. This is just an overly described tower stuffed full of low-level wizards and creatures. It hints of better things with a map of underground tunnels and spider/man slaves, but can’t deliver. I haven’t read the adventure. But the bodak info…… The background could be useful to a DM if the bodak could be a potential ally for the party, either helping to fight Basharn or being used to navigate the tower since it was the former master. In essence, it could potentially be a roleplay encounter rather than a fight, which could be interesting. I agree it could be shortened…and by itself, I think it can have a place. But sounds like a lot of the rooms had this sort of background info–which I can see your point about it clogging up things. Oh. Now that looks like fun! Too bad it sounds it like it doesn’t quite live up to the promise of the cover. Still though, there might be something here I could use.